Decorating ideas for children's bedrooms, Schools, Hospital corridors and children's wards, Doctors surgery waiting areas. 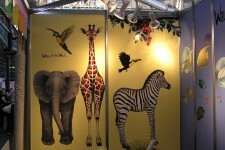 Jungle Animal Wall Stickers have been used on the BBC's DIY SOS Programme. These themed wall stickers are great for a quick makeover or part of a fully themed African adventure. What could be easier than Peel and Stick ? With loads of your children;s favourite Jungle animals to choose from, All priced seperately so you can decide which ones to have. Monkey's, Elephants, Giraffe's, Lions etc plus a selection of Jungle trees & plants to complete the theme. They will not damage the wall in any way when removed. 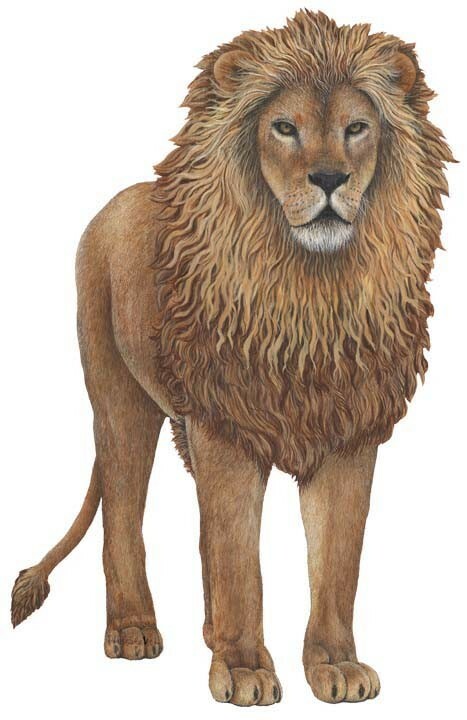 Sizes range from a 15" Lion cub to a whopping 47" Grown Lion. 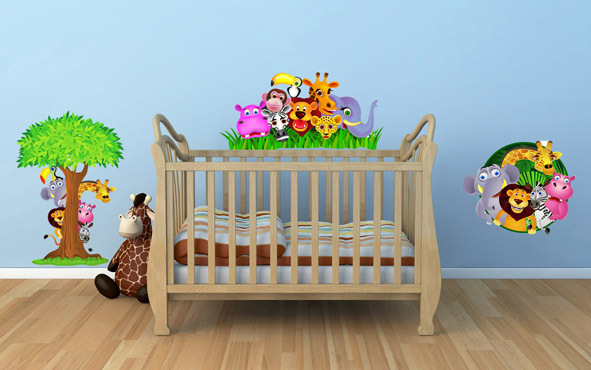 See all the Jungle animal wall stickers shop Including our new multi animal sets. Can't decide which jungle animals to have? Why not have them all ? 15 Jungle animals supplied on two large 120cm x 60cm sheets. All for only £68.50. Trees and plant packs are also available at the same price. Build your own design, all on one wall or perhaps a few of other walls in the room. The all new Walltastic Jungle Adventure mural. This is a new concept in childrens wallpaper design. 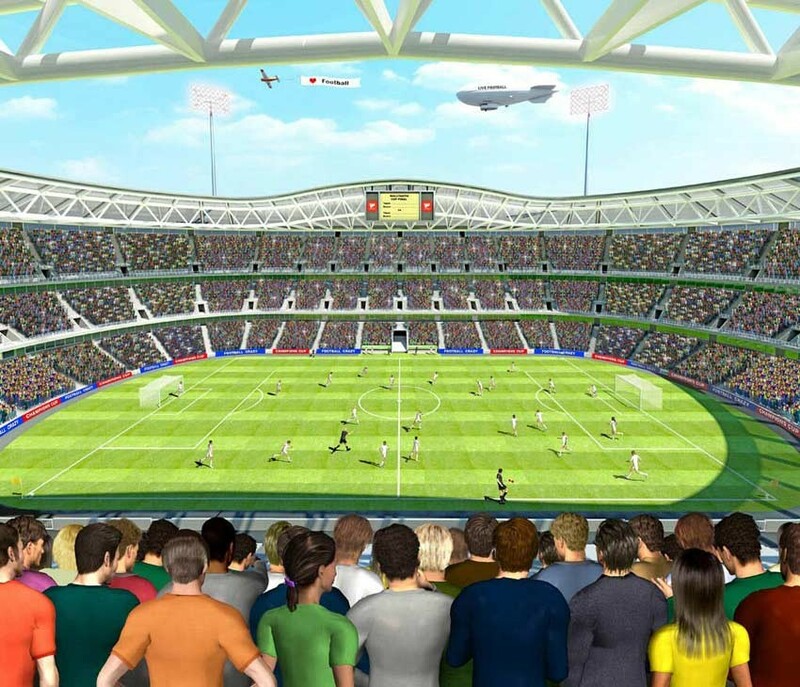 It creates a stunning effect that amazes kids of all ages, boys & girls alike. An immediate WOW FACTOR to any boys or girls bedroom wall. These wallpaper murals fit all walls up to 10ft x 8ft if your wall is smaller just simply trim to suit. 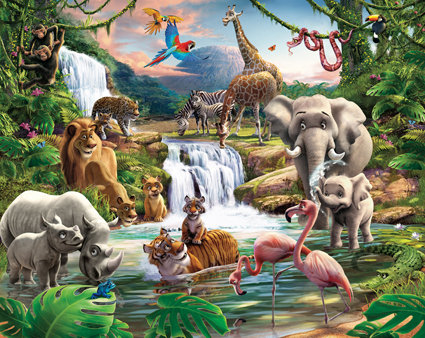 All childrens favourite Jungle animals in one big picture, all set in a wonderfull rainforest scene. Was £44.95 Now only £40 for the whole wall !! Visit our Mural Shop. With one of our false windows.These new Giant wall stickers come in one piece an look amazing, they really do look like a real window. 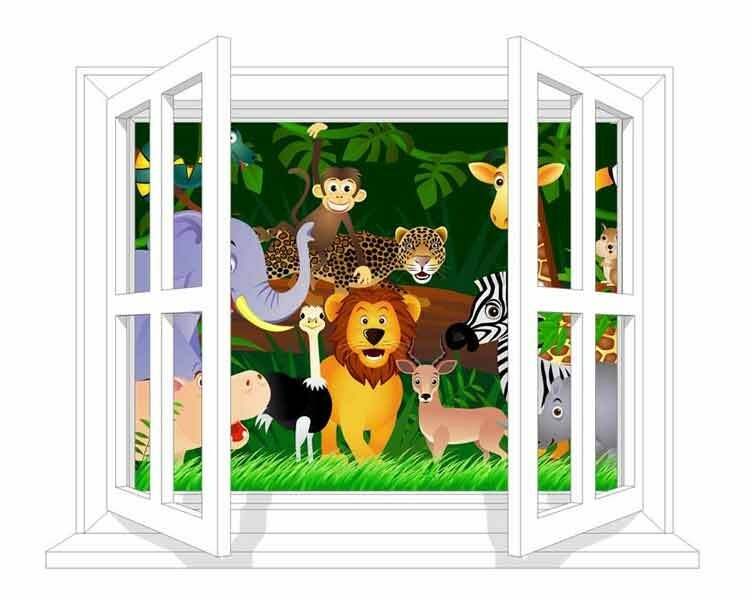 Fun-Decor are proud to announe these new Jungle safari range of wall stickers for kids. These funky stickers create a stunning effect that children love, boys & girls alike. 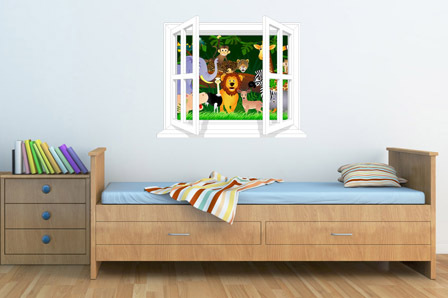 Kids wall stickers can be used not only on walls but furniture too. You'll receive a box containing four sheets of glossy stickers, each sheet measuring 120cm x 60cm. This gives you plenty of stickers to complete your mural. The Giraffe stands at 118cm tall on the large four sheet pack and is 59cm tallon the single sheet pack. 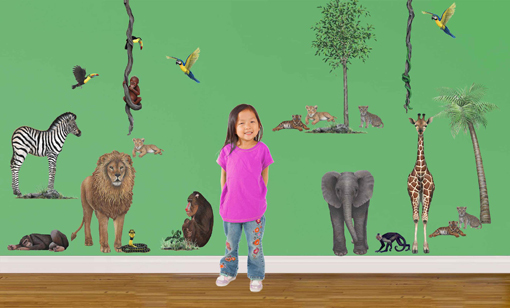 A lovely range of Jungle Safari themed wall stickers for children, Featuring all their favourite zoo and jungle animals. And to complete your Jungle theme. How about some jungle trees & jungle plants, the scale of these stickers match the scale of the all of our jungle animal stickers and really do finish the room off, creating a true Rainforest / Jungle effect. These Plants & Trees can be used with all of out giant wild animal stickers, Jungle animals, Dinosaurs and even the Farm Animals. 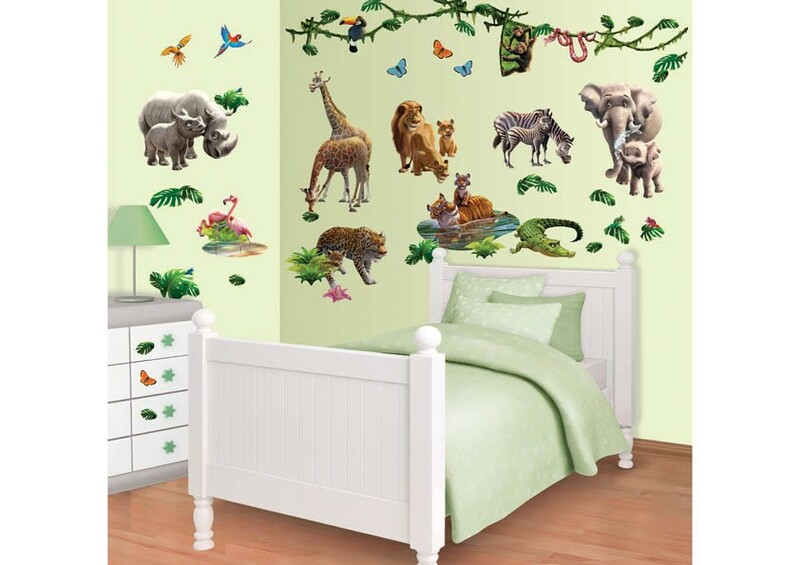 Shop Now for Jungle Wall Stickers. Or follow one of these links. Each large, bright wall decoration sticker can be used individually, or combined to create a stunning wall mural, for a childrens nursery, an infants bedroom or even a kids wall mural inside a playhouse, Your kids will love these unique stickers, transforming your children's bedroom, or nursery in minutes! Simple decorating ideas for childrens bedrooms, easy to do yourself with professional results every time. Our range of giant wall stickers appeal to boys & girls of ALL ages. 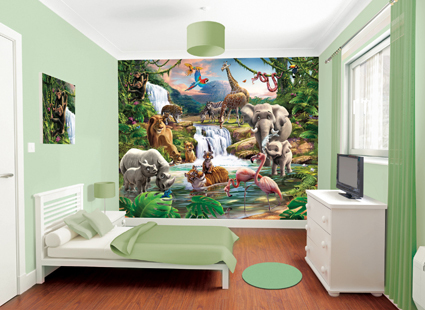 The wallpaper mural is ideal for children and adults alike. It measures 194 x 270cm (6'4" x 8'10") and comes to you in 4 pieces. A picture from one of the Fun-Decor shows. 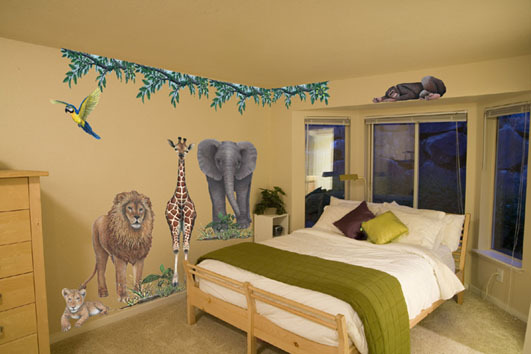 Fun Decor.com supply these Jungle themed wall stickers, wallpaper murals and mirrors not just to the UK but all over the world including Australia. We have also supplied our products to the ITV for their 60 Minute makeover programme, and to the BBC for DIY SOS.